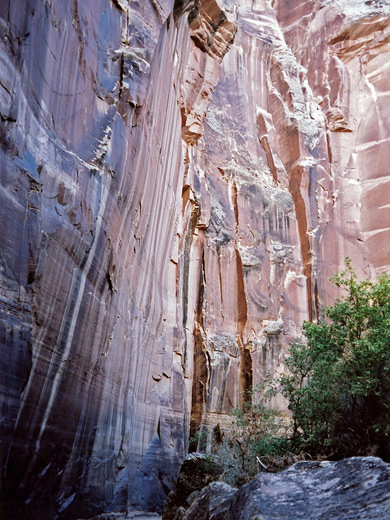 Undisturbed, peaceful and geologically varied, Eardley is one of the best canyons in the San Rafael Swell. It begins a few miles inside the eastern San Rafael Reef, just south of I-70, where several shallower tributaries meet, has a number of impressive narrows sections of increasing depth then becomes more open and V-shaped but deeper still, with much colorful crumbling rock and some interesting water-carved passages, before exiting the reef after 10 miles via a series of huge sheer-sided potholes that require rappelling equipment to negotiate although they may be bypassed by climbing the cliffs and walking at rim level. Two days are needed for the complete trip and a week could be spent exploring this and other canyons in the area. Eardley Canyon may be explored from the north end by various dirt tracks starting from three I-70 exits, entering via either one of four tributary canyons named Crawford Draw, Middle Fork, Red Draw and Hyde Draw, or from the south end via UT 24 - a rough side road follows the streamway, here known as Straight Wash, to the point where it emerges from the Reef (the same route used to reach Iron Wash). The northern tracks are best as they offer the quickest access to the upper narrows, and the easiest is along a small side ravine between Red and Hyde Draws, for which the start is exit 131 of I-70. From here the paved Buckhorn Draw Road parallels the north side of the interstate for 3.6 miles east then splits, as the pavement ends. The right branch turns south, crosses underneath the highway, and divides again. The left fork proceeds southeast for 1.8 miles to a Y-junction, then finally the right branch at this intersection passes the site of a former airstrip at Cliff Dweller Flat and ends at the edge of a rocky scrub-covered plateau - an isolated location, and an excellent place to camp. The land falls away steeply to the south and several canyons are visible in the distance - Eardley is the deepest, running northwest-southeast. The suggested route is down the slope and across the flat land below, veering west slightly to the edge of a short ravine. 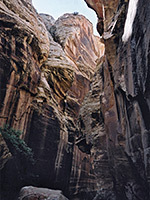 A little way beyond where this joins the main canyon the otherwise sheer walls are interrupted by a steep, boulder-covered slope, and the canyon floor may be reached by scrambling down. 15 views of Eardley Canyon. Rocks around the canyon edge have a mixture of colors, eroded formations and plentiful exposed thin-bedded limestone - a hint of the attractions to come. Once on the canyon floor, the way ahead is sandy with occasional downward steps of a couple of feet and is generally quite open. The streamway turns due east and narrows after a while, through one particularly pretty stretch of crisp angled strata carved into different forms, soon after which the Hyde Draw tributary joins from the left; this can be used as an alternative entrance but ropes are needed to overcome a sheer drop at the junction. 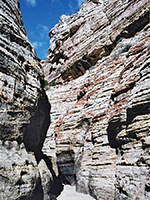 The main canyon veers south and soon enters deeper narrows with no obstacles, just a clean flat sandy floor beneath high Cedar Mesa sandstone walls. In some places clear (drinkable) water seeps out from between layers near the base of the cliffs. The gorge becomes gradually wider and another tributary joins from the west, from behind a high sandbank. 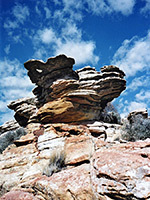 The rocks above rise steadily higher and the curves become wider, with several hundred feet of the canyon visible ahead. Pebbles and boulders are scattered in the streamway, which is now quite overgrown with large cottonwood trees, reeds and grass. Later these fade away, replaced by more fallen rocks and flat terraces scoured by smooth, water-carved channels. 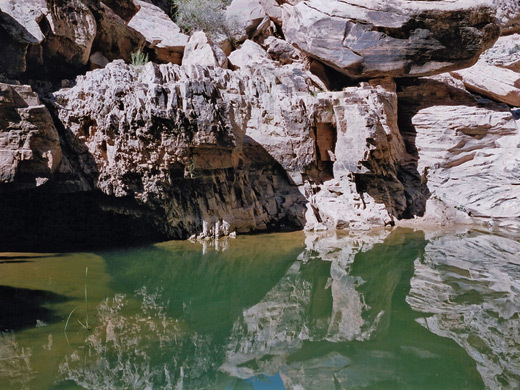 Other notable features are a clear pool with deep water, a dryfall several meters high that may be passed by climbing down on the right hand side, and another sheer fall after about 6 miles. This marks the point at a 180° bend in the canyon where the floodwaters once broke through a narrow separating ridge, creating a rincon (abandoned meander), and leaving an isolated peak in the middle of the two channels. 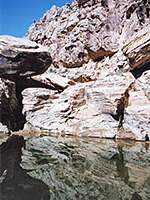 From here the boulders in the canyon become larger, causing many downward drops of a few meters and frequent pools underneath. There are several V-shaped narrow passages with very old-looking, weathered limestone rocks, one of which leads steeply into a muddy area, site of a deepish pool in wet weather. More boulders and exposed strata follow, as Eardley Canyon nears the edge of the San Rafael Reef; just before is the technical section with 6 deep potholes, all or most of which require swimming. This part is usually explored starting from the southern entrance. I visited in mid October, on a still, essentially cloudless day with clear blue sky from dawn to dusk, conditions which emphasised the striking colors and textures of the rock. The canyon had absolutely no litter or other footprints and seemed completely unspoilt. A round trip to a point not far above the potholes (about 16 miles) took 8 hours.